Really quick post this time. Love Wisteria paper by Basic Grey. This card reminds me of the song, “I’m just a bird in a gilded cage.” Yep, really old, no wonder you haven’t heard of it! This card used Pretty Perches by Clear Dollar Stamps. I cut the patterned paper edge with scalloped scissors and edged it with my gold paint pen. The bird was stamped with eggplant ink and then I overstamped the cage with Versamark and embossed with gold EP. 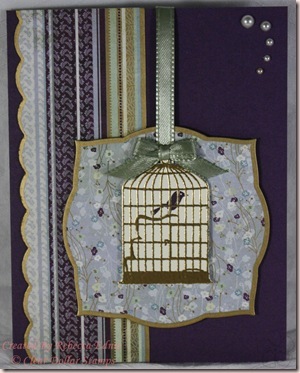 The patterned paper beneath the birdcage is cut with Labels 3 Nestabilities die and also edged with the gold paint pen. I thought the upper right corner looked a bit naked so I added a few halfback pearls. The ribbon was tied with my Bow Easy, the other ribbon isn’t attached, just glued in behind. Paper: wisteria-Basic Grey, vanilla, eggplant CS-SU!